Hockey players from the Baker Hutterite Colony are keeping their sticks — and skirts — on the ice on Monday as they take on the MacGregor Iron Maidens in MacGregor, Man. 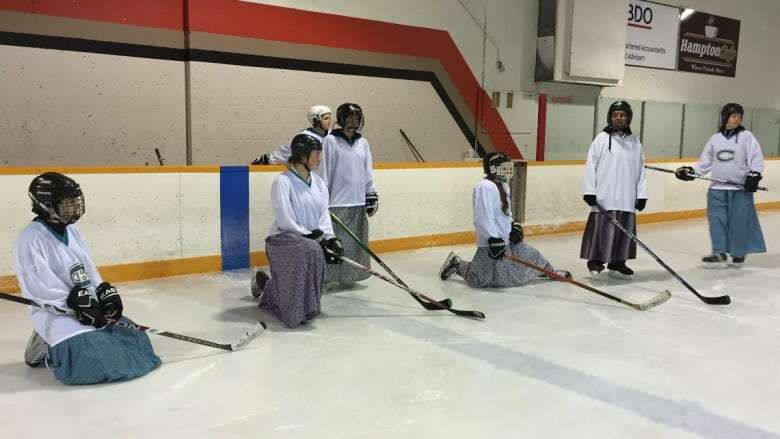 Hockey players from Manitoba's Baker Hutterite Colony are keeping their sticks — and skirts — on the ice on Monday as they take on the MacGregor Iron Maidens. The game between the colony in MacGregor, Man., and the town women's team is the fourth annual match. The Baker team is also hosting a clothing drive for refugees at the arena this year. Tirzah Maendel, one of the Baker Colony players, spoke to CBC's Ismaila Alfa about what the crowd can expect at Monday's game. How did this event get started in the first place? We happened to be at the rink, us Hutterite girls, and we were watching an all-girls tournament being played, and we just watched the girls and looked at each other, and it seemed to us that we would be able to compete at that level. We just approached some of the MacGregor players and asked if they would be interested in organizing a game and we were able to work it out. Very cool. So, what have the results been for the last three games? I couldn't remember the score, but I think we have an [undefeated] record. How do you play hockey in long dresses? Honestly, it's just what's normal and comfortable for us. We don't feel that the skirt is any kind of a hindrance. In fact, we think it's a bit of an advantage for us. The skirts might stop some pucks that wouldn't normally get stopped. Plus, it's lighter. Equipment can get a bit heavy, especially bulky pants. We think we're faster because of [the skirts]. How much hockey gets played among the women on the colony? We play a fair bit. A few of us would join in with the guys, that would be two or three times a week, but in terms of all-girls games, that wouldn't be as frequent. But we do skate a lot. It's a fun pastime, on our community at least. How did you first get into hockey? I've been playing since I was eight. I've always enjoyed the sport. I've always played at any opportunity. What's the social interaction like with the Iron Maidens team from MacGregor? We don't know them all that well, but we do connect through business, and it's fun to see them in town and interact that way. But on the ice, we play hockey. How heated does it get on the ice? It's competitive, but no, there's no body contact. So, there's no elbows thrown or anything like that? How important is it to interact with people outside the colony for your group? I think it's a good thing. I think it shows that we're just normal Canadians who enjoy hockey as well. It shows that we can also have fun and just roll with it. Speaking of having fun, is there an audience or a crowd? Do people come and watch and cheer at this game? Yeah, it's sort of grown in popularity. The first year it wasn't all that many but I guess the word has gotten out, so I think there will be even more people tonight. What do you hope to achieve by adding a fundraiser this year to the event? We're doing a clothing drive for refugees. There's two families coming to Portage so yeah, if we can get some clothing collected … that funding will go to our coalition. Great stuff. Any predictions for the game? We're just going to go out and have fun.